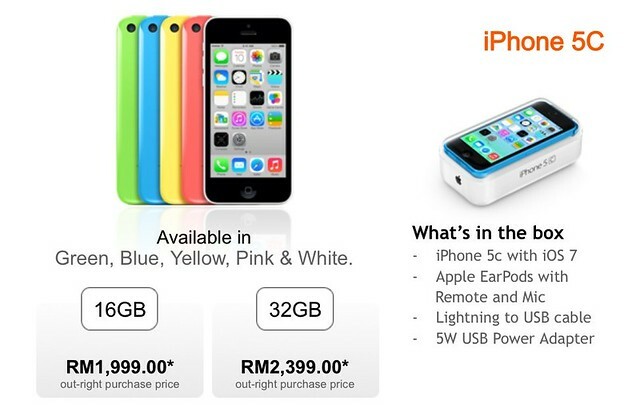 The latest iteration of the iPhone will only be available in Malaysia on November 1, but that does not stop people from speculating the launch prices of the two variants - iPhone 5S and iPhone 5C. UPDATED: Apple Store Malaysia has published its pricing and the prices are exactly as what appeared on Technocrats (one of the Authorised Apple Resellers) website. Source: Technocrats. These appear to be RM200 more expensive than the iPhone 5 when it was launched. Most of your local retailers and resellers will have them next week, so, check them out. I don't understand the point of having 5C... might as well create another model hahaa. In many major markets like China, Japan, the 5C is already showing sign of failure. I think they got it wrong with the pricing. If I can afford a 5C at RM2,399 why should I not go for the better 5S for just a couple of hundred more Ringgit? I finally got my unit last weekend, it's an iPhone 5S, 32GB, Space Gray for RM2,699 from Bluecube, Suria Sabah. I actually got mine RM50 cheaper than the retail price. Technocrats outlets are selling exactly as per RRP but they are hardly stocked. Other resellers seem to be putting premiums over the RRP. At an outlet at Suria Sabah, the 16GB, Gold iPhone 5S is selling for RM2,999 (RM600 more than the RRP). Space Gray and Silver are sold RM200 to RM300 more expensive. I suggest you stick to Bluecube and Technocrats, or order online at Apple Store Malaysia.